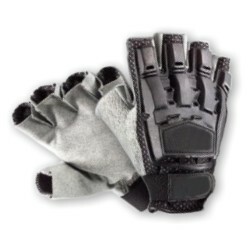 Our tactical Plastic cover over backhand for cushioning against fire , leather back hand, avaialbe in Clarino (Amara) with mesh fabric Velcro wrist straps. Hooks and loops. The Velcro closure for snug best fitting. Ventilated side panels for proper air corssing. The vents in plastic cover backhands for ventilation and comfort..